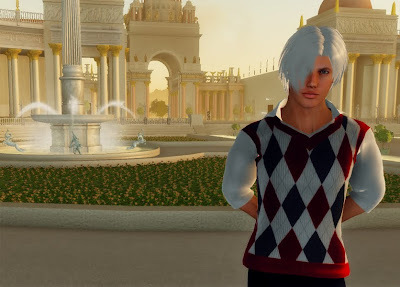 In an effort to get out of my habit of nearly ignoring the men's fashion market, I've created a handsome male doppelganger named Siris Ophelia (a name I've used for male avatar incarnations in Second Life, as well). I'm the first person to admit that my coverage of men's fashion has been rather weak– only a fraction of my daily blogging in nearly four months has dealt with the boys. While it's true that women's styles tends to dominate most virtual fashion scenes, menswear in Blue Mars is not as far behind as you might expect, so it's about time that I give the boys the attention they deserve! I've started Siris, much like I usually start Iris, with a skin and shape from Moxxi in Port Town (Blink teleport here). Aaron is Moxxi's combo set for the guys, and I have to say that it's quite gorgeous. For a slightly more rugged look, you may want to swap the Aaron skin for one of the dashing men's skins from Adam n Eve in Caledonia (Blink teleport here). 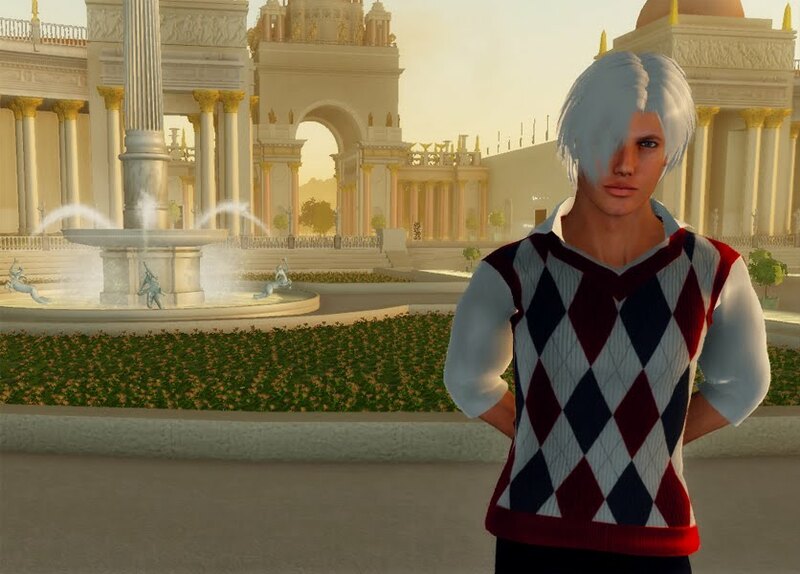 I'm not usually a fan of white hair on young men, but I had to grab this hairstyle from Z#Road in Shade City (Blink teleport here). Z#Road is actually a men's brand from Second Life, designed by Yukimaru Koba. If you recall, I covered a blog post by Yukimaru about his adventures in Blue Mars, and pined for him to release some of the elements of his own gorgeously modeled avatar to the martian masses, so of course when I came across this hairstyle he released I just had to have it. I have to say that between the texturing and the underlying structure it is easily among the nicest hairstyles I've come across in Blue Mars to date. I'm incredibly jealous that this piece is just for the boys! My next stop was Pink Fizzy Soda Designs in Gaia (Blink teleport here) for a preppy sweater and shirt combination top, along with a pair of black cargo pants. I love the straight-laced Ivy League look, but if you want something a little more street then you may want to swing by Electron Tri-D in Tharsis Estates (Blink teleport here), a brand I covered in October. Finally, I checked in to Caledonia (Blink teleport here) for a pair of polished men's shoes from dapper gent Mako Magellan's menswear line. 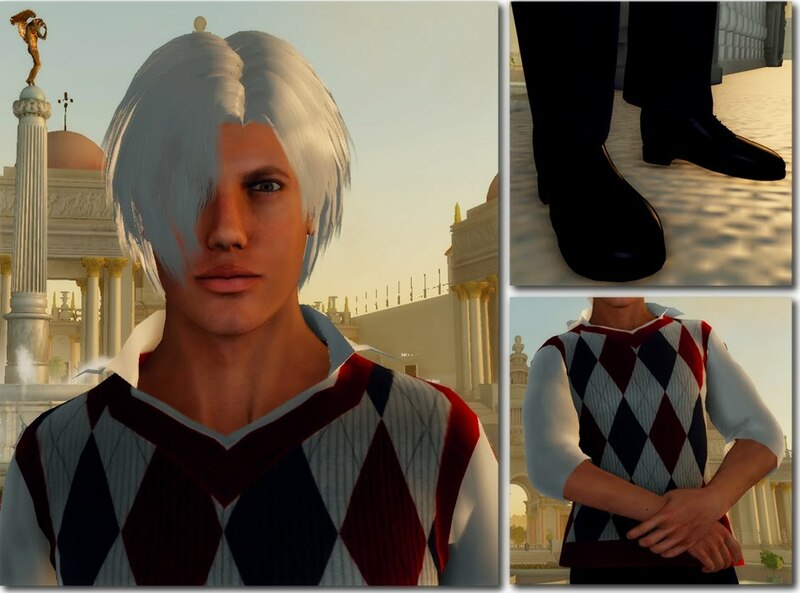 If you're after a more formal ensemble Mako's boutique should be your very first stop, and he even helped Hamlet recreate his signature avatar style. So tell me guys, what are your favorite menswear lines in Blue Mars? Email me, or leave a comment!